The City of Toronto is carrying out waterproofing and structure rehabilitation work to the St. Clair Reservoir at Sir Winston Churchill Park. These necessary upgrades will help to ensure the structural integrity of the reservoir, extend its service life and bring the infrastructure to a state of good repair. For the next 4 Saturdays, construction crews will be working on site between 9:00 a.m. and 5:00 p.m. This work is taking place outside of normal construction hours (Monday to Friday, 7:00 a.m. to 7:00 p.m.) and is dependent on good weather. The contractor will be working on waterproofing, backfilling and forming the light bases for the tennis courts. Work crews will be operating equipment such as mini excavators, compressors and generators, which will result in increased noise levels on site. Relevant City by-laws regarding noise restrictions will be strictly observed. This work will allow the crews to regain some of the time lost due to winter weather. Please note that rehabilitation work on the St. Clair Reservoir is on schedule and is anticipated to be completed in fall 2019. Changes have been proposed to the Sir Winston Churchill Park Dogs Off-Leash Area and tennis courts. The City hosted a public drop-in event on December 11, 2018, where participants were able to learn about the status of the reservoir rehabilitation and park restoration, view the draft concept plans and designs for the proposed off-leash area and tennis courts, speak with City staff and complete feedback forms on the proposed changes. The feedback form was also available on the project website until January 4, 2019. Please refer to the Public Consultation Report and public event panels for more information. Sir Winston Churchill Park has been closed to the public since the summer of 2016 for rehabilitation work on the St. Clair Reservoir. The work is being completed in two phases and the park is scheduled to fully re-open in the fall of 2019 when all of the rehabilitation work is complete. Work on the northwest section of the park has been completed one year ahead of schedule. Due to the early completion of this work, the northwest part of the park will re-open in December 2018 (please refer to map below).The remaining areas of the park remain closed and are scheduled to re-open in the fall of 2019 as per the original project timeline. 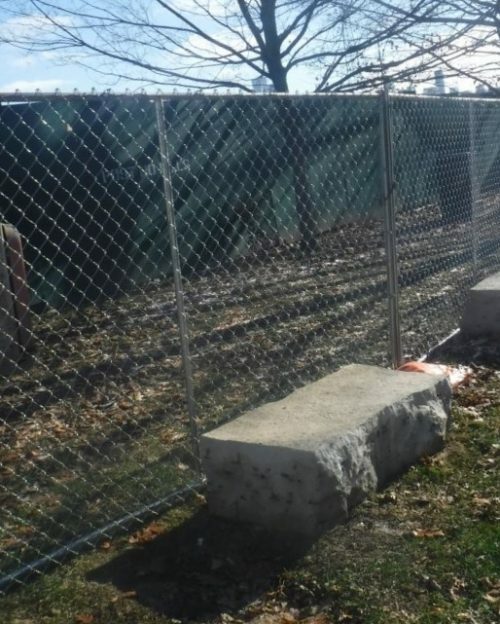 As part of this early opening, temporary safety fencing has been installed outside of the construction hoarding in the northwest section of the park, to allow the contractor to safely remove the existing construction hoarding (the 8 foot high green fence). Once the hoarding has been taken down, the temporary fencing will then be removed, and the northwest section of the park will re-open to the public. Crews will be installing the temporary fencing and removing the hoarding in early December. Park users are reminded that there is no winter maintenance on the walkways and stairs in this part of the park. Dog owners are reminded that dogs must be kept on-leash in this part of the park. Temporary fence installed during construction hoarding removal and to separate the active construction zone on the east side until fall 2019. The contractor will be constructing planter boxes with concrete blocks. Please note that rehabilitation work on the St. Clair Reservoir is on schedule and is anticipated to be completed in Fall 2019. Sir Winston Churchill Park will remain closed until that time. Thank you for your patience. Construction crews will be working on the St. Clair Reservoir site on Saturday, April 21, from 9:00 a.m. to 5:00 p.m. This extensions of work outside of regular construction hours (normally Monday to Friday, 7:00 a.m. to 7:00 p.m.) is needed as a result of recent weather, which has delayed progress. The work performed on Saturday will involve removal of the existing waterproofing membrane on the roof of the reservoir. This period of work will allow the crews to recuperate some of the time lost due to the inclement weather. The City of Toronto will be replacing two 1,200 mm diameter valves within the St. Clair Reservoir. The City’s contractor has been allotted 48 hours to complete this work as the replacement requires a complete shutdown of the reservoir. The contractor may therefore be required to work outside of the 7 am to 7 pm construction window to complete the replacement within the allotted time. This work will not impact the water in your home. The City was invited to the first meeting of the newly formed Sir Winston Churchill Park Association to provide an overview of the St. Clair Reservoir Rehabilitation project. Please view the presentation slides for more information. Originally constructed in 1930, the St. Clair Reservoir is home to the Sir Winston Churchill Park which sits atop the reservoir’s green roof. The structural repairs to the reservoir are essential to maintain a sound base to support the park which is enjoyed by local residents. This project is part of the City of Toronto’s approved 2015 Capital Works Program and is scheduled to be completed by Fall 2019. Park fixtures to be replaced in cooperation with the Parks, Forestry and Recreation Division. The City of Toronto will be hosting a public drop-in event on the reservoir rehabilitation and park restoration, including proposed changes to the Dogs Off-Leash Area and tennis courts. A Public Open House was held on June 3, 2015 for community members to learn more about this project, the construction schedule, and what disruptions to expect. What is a reservoir and what does it do? A reservoir is a structure used for storing water. The St. Clair Reservoir stores drinking water from Toronto’s water treatment plants and is vital in managing water supply and demand, storage for fire protection as well as providing surge protection to reduce watermain breaks and service disruptions. The St. Clair Reservoir is 85 years old and requires upgrades to ensure the concrete structure is waterproof and structurally sound. This work will extend the reservoir’s service life and bring the infrastructure to a state of good repair. When did the work begin and how long will construction take? The contractor began installing hoarding for the first phase of construction on July 25, 2016. A Construction Notice was issued in advance. Phase 2 of the rehabilitation began in May 2017 and will continue until the full project is completed, in Fall 2019. 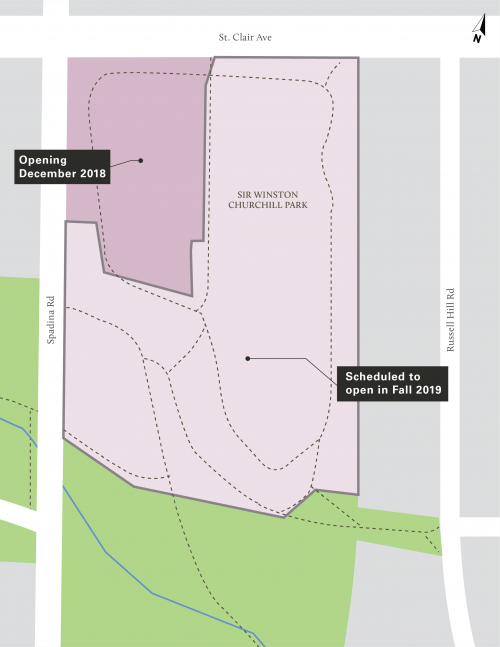 Will the public have access to Sir Winston Churchill Park during construction? In order to complete the work in a safe manner, portions of the park are required to remain closed during each phase of construction. Phase 1 – Playground, 6 tennis courts and dog off-leash area will remain open. Phase 2 – All areas of the park will be closed for construction. Will Sir Winston Churchill Tennis Club remain open during construction? Construction was staged to allow the Sir Winston Churchill Tennis Club’s courts to remain open through Summer 2016 and for a minimum of six (6) courts to remain open until the end of the 2016 playing season. The City worked closely with the Sir Winston Churchill Tennis Club Executive to maximize court availability as well as locate alternate courts outside of the reservoir rehabilitation project area. The Tennis Club Executive can provide further information on membership during construction. Will the Dog Off-Leash Area remain open? Construction was staged to allow the Dog Off-Leash Area to remain open during Phase 1. The off-leash area is currently closed and will remain closed throughout Phase 2 of construction. A public notice regarding the closure of the off-leash area was issued in November 2016. Dog off-leash area users are encouraged to visit other dog off-leash areas including: Wychwood Barns, Hillcrest Park and Cedarvale Park. Please check the City of Toronto website www.toronto.ca/parks/dogs for information about other off-leash areas, hours of operation and site specific conditions of use. Will any trees from the top of the reservoir be affected by this work? All trees on top and some trees around the perimeter of the reservoir will be removed as part of the rehabilitation of the St. Clair Reservoir. The project team has worked with an arborist, landscape architect and the Parks, Forestry and Recreation Division to construct a plan for replacing as many trees as possible on site post-construction. There will be no permanent tree replacement planting on top of the St. Clair Reservoir in order to protect the reservoir’s roof structure and membrane. We expect only the top ±25 per cent of the plantings to be excavated in these areas in order to expose the reservoir structure, after which we will reinstate the slope and replant with similar materials. Are there plans to add a water feature and/or rubberized play surface for the reinstated playground? The rehabilitation of the reservoir is part of the 2016-2025 Capital Works Program and focuses on preserving the integrity of the reservoir, extending its service life, and bringing the infrastructure to a state of good repair in order to continue to provide quality water services to the City of Toronto. Safety, quality and sustainability are the main objectives and any additional work is dependent on timing, funding, and City-wide priorities. How much truck traffic will there be? What route will the trucks take? Trucks will be required to dispose of some of the soil from the top of the reservoir and bring new soil when the work is done. All trucks will be required to follow a route from the reservoir to the disposal site that is designed to minimize disturbance on the local community and to the areas surrounding the St. Clair Reservoir. The City will attempt to store as much soil on site as possible in an effort to reduce trucking. Will it be noisy and dusty in the neighbourhood? With any construction project, some dust and noise is inevitable. The contractor will be responsible for ensuring the work area is kept cleaned with weekly sweeping and wetting of the site and roads. Every effort will be made to reduce inconveniences to the community.